What's with the whimsical graphic? 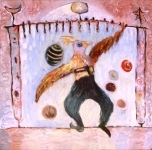 This is an image of the painting Bird Man, courtesy of artist Lynn Rothan. It seems appropriate not only because of the bird-related imagery, but also because the Bird Man appears to be juggling -- and dropping the balls he's juggling. That's a lot like what happens with a shoot-from-the-hip approach to DO-178B. If you like the painting, check out Lynn Rothan's website. Well, birds are free and birds fly. And, I suppose, they're soft. Hence, free software for flight. What does Birds Project software cost? It's free software, licensed to you under an appropriate open-source license. The particular license varies by item, but the Do178Builder program is licensed under the GNU General Public License (GPL). Why are your DO-178B documents so darned big? I don't think they are, really. The sample libBirds PSAC document is large (41 pages) because the document itself is licensed under the GNU FDL and the fictitious software being discussed is licensed under the GNU LGPL. Pages 25-41 of the sample PSAC are simply verbatim copies of these two licenses. How come Do178Builder development is so slow? I've now used Do178Builder for several initial releases of airborne firmware at level C, and for subsequent changes to that firmware. There are plenty of wish-list items for the program, but experience shows that it works well enough for me, and for those developers unlucky enough to be under my influence, so working on Do178Builder isn't at the top of my priority list. Volunteers are welcome. I'll happily tell you about my wish-list if you email me. My name is Ron Burkey, and I've designed aviation hardware and firmware since 1984. I've also had to produce a lot of certification documentation. I don't like it. I figure that a lot of other people don't like it either. On the very slim chance that you want to know more about me, personally, you can click here. This page was last modified by Ron Burkey on 2005-06-21. Contact the Birds Project.